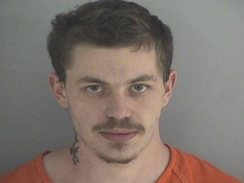 A 25-year-old Ohio man and four others have been arrested for the brutal murder of a 21-year-old woman. Matthew Puccio, of Urbana, met the young victim identified as Jessica Sacco over Facebook and later following on-off relationship subsequently killed her by suffocation. He then reportedly dismembered her body while four other suspects later covered up the crime. According to Puccio, Sacco's last words were, "I still love you, and I forgive you." She was dead in less than 60 seconds. He has since told reporters he's 'insane' and now maintains the recently dead woman begged to be murdered. All the fun filled killer gang of trailer park losers were also self-proclaimed Juggalos.